Montreal and Toronto Restaurants Unite for Sock Drive for Homeless Feet. 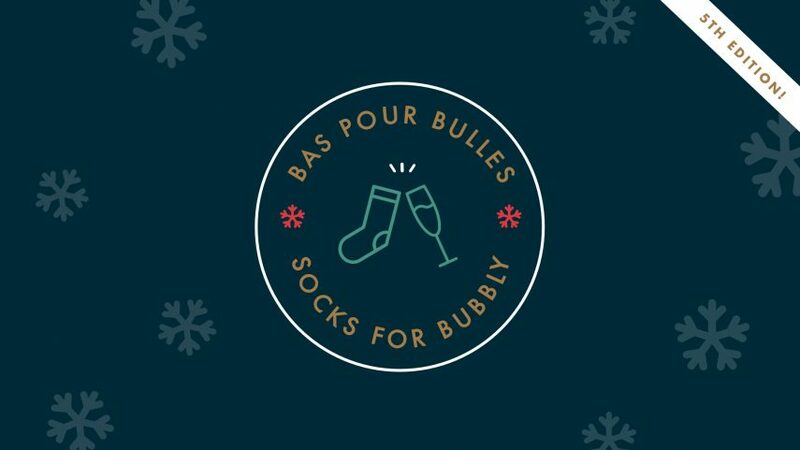 MONTREAL, November 9, 2018 – The Socks for Bubbly (Bas Pour Bulles) program is back for its 5th year. Caffe Un Po’ DiPu, Elena, Foxy, Luciano Trattoria, Marconi, Monkland Tavern, Nora Gray, Pastaga, Pizzeria Gema, Pizzeria Melrose, Santa Barbara, Restaurant Su, Tavern on the Square, Tommy Café + Apéro, Tommy St-Paul, Tuck Shop, Vin Mon Lapin, and Restaurant Gus are the 18 Montreal restaurants working together to raise awareness of the health of homeless feet in the city. The Socks for Bubbly program is proud to count Toronto as part of its campaign for the second year with 14 Toronto restaurants participating: Bar Begonia, Bar Altura, Bar Raval, Bar Reyna, The Civic, DaiLo, The Good Son, I’ll Be Seeing You, Kay Pacha, La Banane, Melrose on Adelaide, Mother Tongue, ONE, and Richmond Station. From November 19th to November 25th, 2018, all participating Montreal and Toronto restaurants will offer a glass of bubbly in exchange for any donation of a new pair of warm socks. To kick off the Socks for Bubbly [#BasPourBulles] program in style, a fundraising dinner will be held at Restaurant GUS on November 13th, 2018. The evening’s proceeds will go towards the purchase of socks for the homeless. “After seeing a documentary about the homeless and how it lifted their spirits to have the comfort of clean warm socks, I started to investigate if they were being served. When I heard about the high demand and low supply of new warm socks, I realized I could help in a small way,” said Socks for Bubbly founder, Chef David Ferguson. The homeless population is vulnerable to our country’s weather conditions, especially in winter. Homeless feet often go bare and are susceptible to open sores that can lead to nerve damage. Although socks (and underwear) are always in great demand at city shelters, they are rarely ever donated, which is the impetus behind the Socks for Bubbly [#BasPourBulles] program. We are proud to be working with Montreal’s Old Brewery Mission and Toronto’s The Scott Mission organizations, which have agreed (with great appreciation from all those involved) to distribute the socks efficiently. They are performing invaluable work with our cities’ homeless youth and marginalized population and will make sure each pair of socks find fitting feet. – Matthew Pearce, CEO, Old Brewery Mission. Listen to the CBC Sunday Edition documentary that inspired chef David Ferguson to start the Bas Pour Bulles [Socks for Bubbly] fundraising event 5 years ago. Program sponsors this year include Newad, Solisco, Bookmark Content and Communications, and media event partner Wines of Germany.